Punctuated Equilibrium is a theory of evolutionary change that accounts for both the overall stability of large populations across time and the process–or periods–of significant change–e.g., in the species, if studying biology, or the social practice, if studying human organization. Generally, species maintain themselves as species by not changing, which happens because most local adaptations are diluted by more comprehensively functional features, but adaptations that develop at the margins of the population, where the species is less likely to match environmental conditions, can acquire selective advantages that subsequently can spread quickly across the population. So why am I telling you this? The question came to mind of what image of the world is being maintained by photojournalism, and particularly coverage of world politics. Were we to examine the photographic record as if it were a fossil record, would we see a history of punctuated equilibrium? More to the point, when we look at the images in the news, do we see a world of general stability punctuated by moments of rapidly spreading change? Or do we see another model of collective behavior: for example, nearly uniform stability occasionally disturbed but always restored? Or relatively stable civilizations that once in a long while are destroyed or fundamentally transformed by some catastrophic upheaval? Or perhaps a continual improvement regrettably but inevitably accompanied by “creative destruction”? Or, if we do see a stable order that is occasionally subject to rapid change, what is the norm and what is developing in the margins? And might we see these larger patterns across images or inside of individual images? Let’s look at two photographs to consider how this line of thinking might develop. 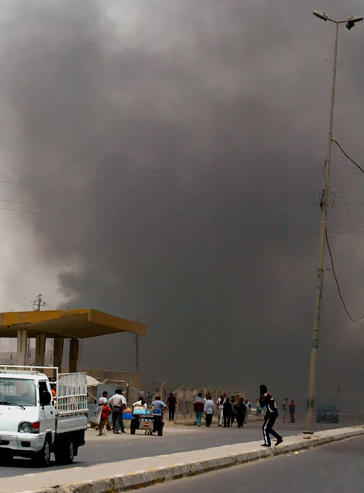 This photograph depicts the aftermath of a car bombing in Baghdad. It is one of hundreds of images that I could have grabbed from the last month’s slide shows: images of bombing, rioting, shooting, clubbing, and similar forms of violence. These are images of disruption. For example, we see the mise-en-scene of ordinary life–and the blast. Street with truck, curb with light pole, functional building and people going about their business–and looming up where there should be light and perspective, a dark cloud, miasmic, bearing bad news on an ill wind. But the cloud will disperse, the truck start up again, the people break away to get back to a semblance of routine, right? This photograph also features an ordinary scene–cultivated fields greening in the springtime–and a dark shape, but one that is not threatening. 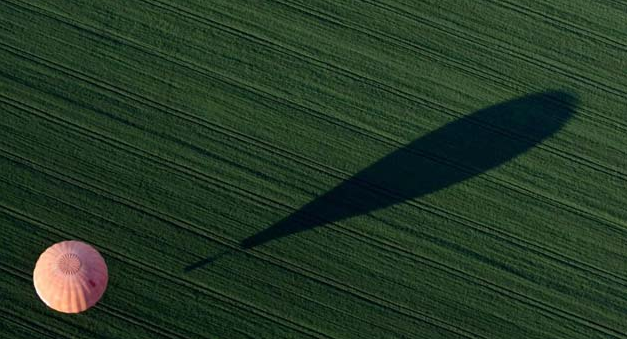 The balloon’s shadow is but an extension of the sunlight illuminating the balloon and feeding the crops below. Instead of being faced with a loss of control, the elongated shape can stand for the magnified sense of freedom and personal extension that one might feel while floating above the earth. Whether thinking of the special experience of being aloft in a hot air balloon or the collective good in verdant fields stretching to the horizon, life is good. And so it goes. The newspapers, magazines, and slide shows feature a steady stream of both images. On the one hand, hard news images of continual disruption (whether political or natural disasters), and, on the other hand, soft news images of peace and harmony (both natural and political). It might be that journalism in a democratic society is inclined to present a dystopian world–by contrast to the obligatory good news of an authoritarian press–but that the need to hold on to readers also motivates the signs of reassurance provided by the soft news. The question remains of which view is correct. Which tendency is more characteristic of the species, and which might be a marginal adaptation? Is civilization the norm, with violence a marginal adaptation, or is violence the general characteristic of the population, punctuated occasionally by selective adaptations toward peace? Look again at the photographs. Which is more indicative of what is breeding at the margins today? is it light technologies and sustainable cultivation that can bring some degree of prosperity and peace across a planet riven by conflict? Or is it anarchy and war that can spread contagiously in a global order built upon the competition for non-renewable resources? Photographs by Ahmad Al-Rubaya?AFP-Getty Images and Viktkor Veres/AFP-Getty Images. Next Post →When is a Flag Not a Prop? Don’t you have to consider the conditions of circulation to answer your earlier question: “what image of the world is being maintained by photojournalism”? Should we all encounter photojournalism via the slide show, reading these images against each other might be fair. But aren’t we (or if not just you and me, publics) more likely to encounter the disruptive, minor or otherwise, than the harmonious? Isn’t greater weight imparted to the image of hard news than of soft? Alternately, might it be that these two positions are not the adapting margin and the characteristic norm but instead more of the same that we are increasingly allowed to see as technologies of visual production and circulation (the internet slide show, for instance) become more accessible?